Taguig has now been put on the investment map principally because of a well thought out development project that is Fort Bonifacio. Aside from its proximity to the business and financial districts of Ortigas and Makati, the principal selling point of Fort Bonifacio lies in its size. 26 square kilometers of contiguous real estate which is practically the dream project of all companies engaged in the planning, development and sales of real estate. 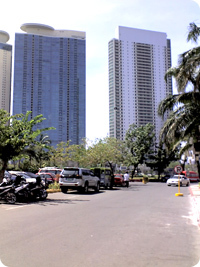 Fort Bonifacio is also categorized as a mixed-use zone. As such, potential lot owners may have greater flexibility with regard to the proposed usage of their land. As a mixed-use zone, restrictions designed to protect the market value of the area have been put in place as well. One such restriction is the Floor Area Ration (FAR) scheme, where a certain lot can only accommodate a certain amount of construction and development. This ensures that over congestion does not crop up from out of the blue. The FAR scheme also ensures the correct level of delivery of basic services. The development of Fort Bonifacio is not only limited to what you can see, but also to what you do not see. Power lines, which normally form part of our urban landscape, has been put underground along with gas lines. A 22 million gallon water containment facility has also been put in place to control flooding, a common and prevalent problem throughout the metropolis. The infrastructure of the 21st century, composed of cutting edge information and telecommunications systems, have also been put in place so that each and everyone in Fort Bonifacio will have access to the information superhighway. Most of the residential buildings in the Bonifacio Global City are upscale, high-rise condominiums that provide a sweeping view of the nearby cities and the neighboring fairways and greens of Manila Golf Club. These condominiums have attracted a high number of affluent Filipinos as well as foreigners, not only for their plush style and comfort but also because they provide much valued privacy in the midst of the sprawling commercial jungle. To date, the Bonifacio Global City has six condominiums, namely Bonifacio Ridge, Essensa, One McKinley Place, Pacific Plaza Towers, Penhurst Parkplace and Regent Parkway. Office buildings have also started to sprout in the area, primarily because of the City’s first-class features that cater to budding and established entrepreneurs. In fact, the Philippine Economic Zone Authority (PEZA) already appointed a portion of the Bonifacio Global City as a Special Economic Zone. 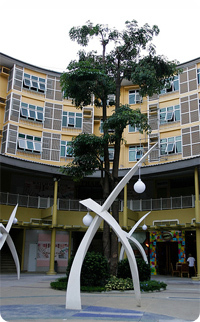 Called the E-Square, it houses two of the City’s first office buildings – the Bonifacio Technology Center and the Net One. Because of their highly competitive technological features, a big bulk of their tenants include IT companies and international call centers. With everything offered by Fort Bonifacio, it comes as no surprise that the value of condominium units is consistently high. Although unreachable for some, those who have already acquired properties will be reaping the benefits of the consistently high value of the entire area. The versatility and progress in the area has made Fort Bonifacio one of the better places to put your hard earned resources. And here, progress has its own rewards. Copyright 2007. Fort Bonifacio | All rights reserved.